They are fast – and they certainly make some Londoners furious. 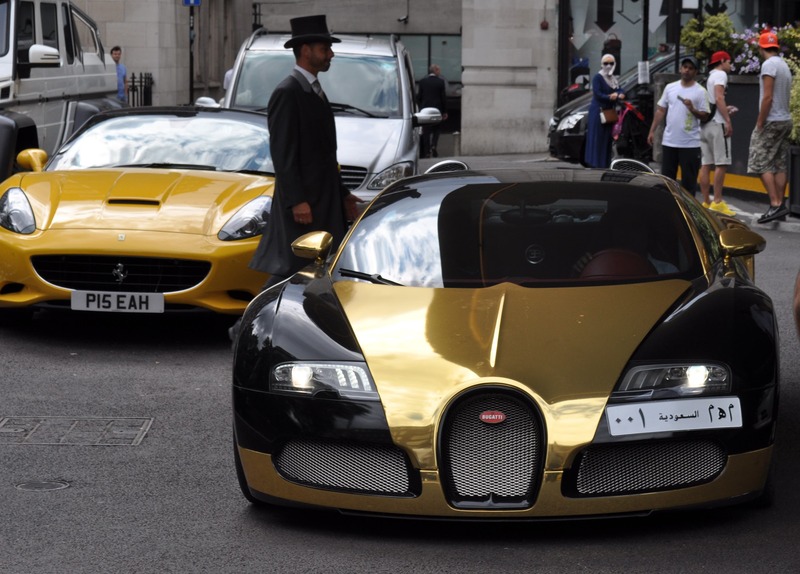 Arab-owned supercars have been seen zooming through the UK capital’s wealthiest streets, as thousands of Gulf residents take a break for this week’s Eid al-Fitr holiday, which marks the end of Ramadan. 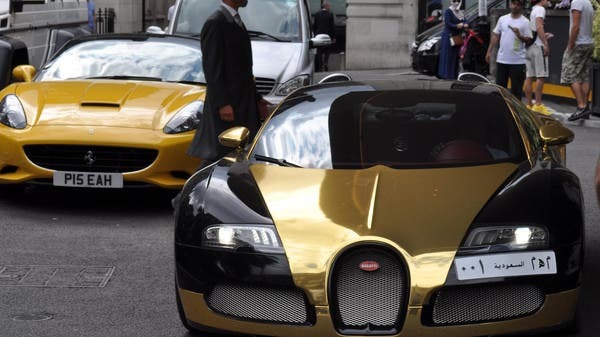 A black-and-gold Bugatti Veyron Grand Sport, worth about $1.7 million, along with a mirror-coated Porsche, bright blue Ferrari and silver Lamborghini Aventador were just some of the luxurious Arab-owned motors spotted by Al Arabiya News on Monday. Such vehicles are often seen in London’s poshest districts around this time of year, with streets around the Qatar-owned Harrods department store, Mayfair and 5-star hotels like The Dorchester abuzz with throaty engine roars. Many supercars are flown in especially for the summer season, attracting crowds of British youngsters with smartphones and cameras – nicknamed the ‘Carparrazzi’ by one newspaper – who pursue the vehicles with the same dedication that celebrity spotters stalk Beyoncé or Bieber. They go to admire vehicles such as a Saudi-registered Bugatti Veron – spotted in London last year – which has a top speed of 268mph (431 kilometers per hour) and an equally high $3.4 million price-tag. Others include a Kuwait-registered KTM X-Bow, which was seen on Monday outside the Jumeirah Carlton Tower, part of the Dubai hotel group. Yet some residents have complained about the noise of late-night racing, with some Arab supercar drivers having attracted both police attention and mounting parking fines. None of this seems to worry Jamie, who spent much of Monday afternoon camped outside London’s The Park Tower Knightsbridge hotel. His quest? To spot the hottest supercars of summer. This requires a working knowledge of the Islamic calendar, as it is the period immediately after Ramadan that traditionally brings a spike in supercars. Jamie, who didn’t give his full name, shares updates and tips on the latest sightings via Instagram and other social media channels. Jamie’s dream car is the Koenigsegg Agera, the Swedish supercar that will set you back at least $1.5 million, with some reportedly changing hands for upward of $4 million. Today, he has to make do with the Bugatti Veyron Grand Sport and blue Ferrari 458 Italia – worth a combined $2 million or more – parked outside The Park Tower. Both cars have Saudi plates; the men who take them for a spin round the block decline to name the owner, saying he is away. Dubai resident Mohammed, 34, steps proudly out of his white Bentley in a street close to Harrods. He is one of thousands of Gulf residents who descend on London either side of the Islamic holy month – in what has become known as the "Ramadan Rush." Unlike some luxury car owners, Mohammed doesn’t fly the car over for summer, with the Bentley reserved purely for use in the UK. He will shop with family and go to restaurants during his two-to-three week break in London. Many of his friends will visit London this summer – some in cars worth millions. “I’ve seen all types of cars, from Kuwait, from Qatar, Dubai,” Mohammed says, before flinging open the doors of the Bentley to reveal the plush red-leather interiors. 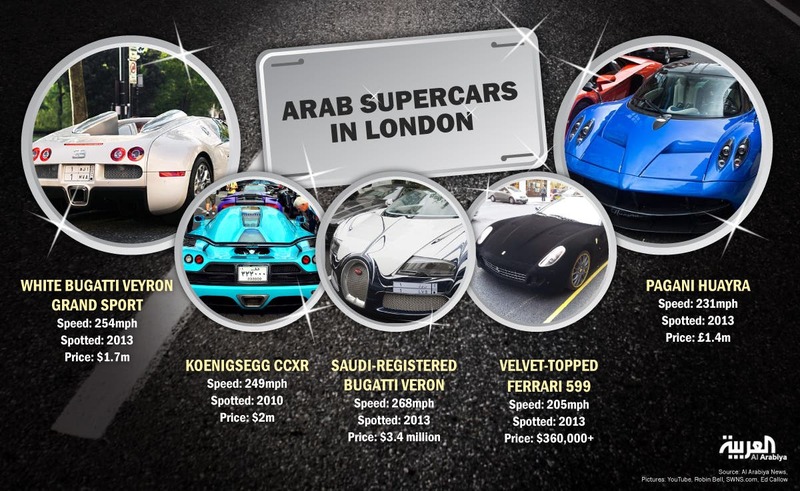 Yet some residents of areas such as Knightsbridge – where Harrods is located – have in previous years complained about Arab-owned supercars racing through their well-to-do streets. There have been allegations of reckless driving, loud engines blazing at 3 a.m. and – from the local council – unpaid parking fines. Mohammed says he never goes racing but some of his friends have been caught by police on Park Lane – the upmarket street bordering London’s Hyde Park. “They’re watching that road – Park Lane – very carefully,” he says. “Some of my mates have been racing at night … they got fined,” he said. Knightsbridge resident Panda Morgan-Thomas has been one of the most outspoken critics of the "Supercar Sweep" that hits London every year. But the management consultant, who lives on upmarket Sloane Street, says there has been less late-night “noise pollution” this year. “This year it has been much quieter. I think there has been increased cooperation between residents and visitors,” Morgan-Thomas told Al Arabiya News. She credits hotels in the area for having communicated the issue to their guests. But other problems persist. Figures from Westminster City Council – which covers the Knightsbridge and Belgravia areas – say that the tally of unpaid parking fines from UAE-registered drivers is growing rapidly. In 2011-12, the UAE came ninth in the council’s ranking of countries with the largest total of unpaid fines, with $54,000 owed. In 2013-14, the UAE had jumped to sixth on the list, with $97,000 in parking tickets owed. One car registered in the UAE – a Mercedes – has a whopping 101 tickets outstanding, placing it among the top 20 worst individual offenders ranked by the council. 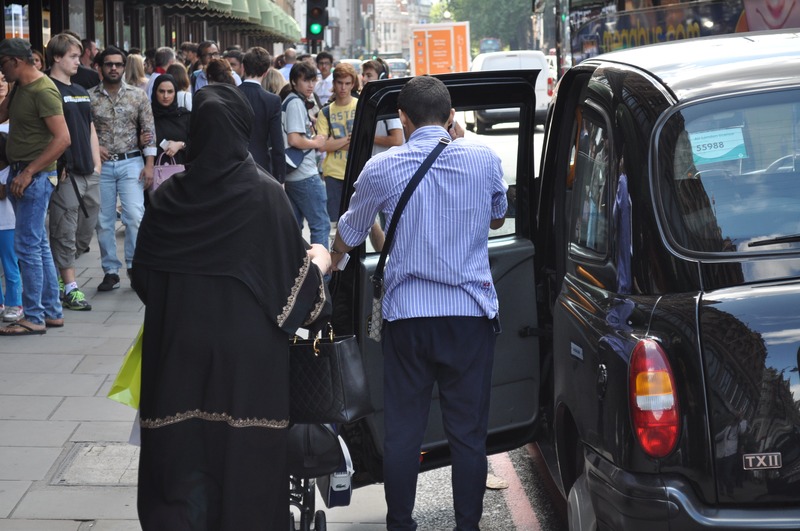 “Westminster City Council does all it can to ensure that all outstanding fines are paid – whatever the nationality of the driver,” a council spokesperson said. Last year, local police confiscated several high-end vehicles, including an Arab-owned purple Lamborghini, which was reportedly seized because the driver did not have a licence or insurance documents. The Metropolitan Police Service says the so-called Operation Cubo – its crackdown on uninsured drivers – has “led to the seizure of hundreds of vehicles, a number of them high-powered supercars seized from foreign nationals”. London’s police service said it was aware of the influx of Arab visitors around the Eid holidays. “As with any large public event - with thousands of people taking to the streets at certain locations, most notably Edgware Road - police must balance the right of those in attendance to have fun with the rights of local residents and the need to ensure public safety,” it said in a statement. Despite some problems associated with the influx of Arab supercar drivers, the season is undeniably good for business. 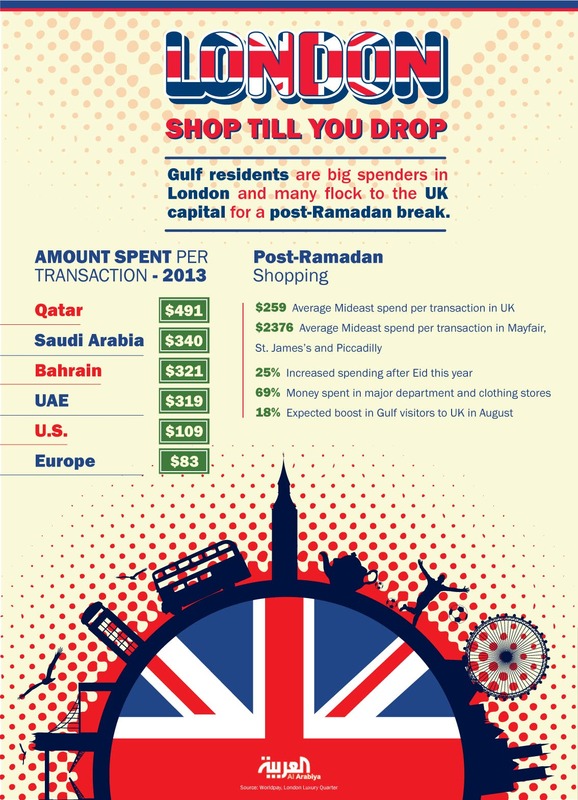 Visitors from the Gulf to the UK are forecast to spur a 25-percent hike in spending by Arab customers in the post-Ramadan period, according to figures from Worldpay. Visitors from Qatar will typically spend $491 per transaction, ahead of those from Saudi Arabia ($340) and the UAE ($319), according to the card-payments firm. In the luxury areas of Mayfair, St James’s and Piccadilly, spending-per-transaction by Middle Eastern visitors stands at a massive $2376, according to Mark Henderson, Chairman of London Luxury Quarter, which represents businesses in the area. Richard Dickinson, chief executive of the New West End Company, which represents over 600 retailers and businesses on Bond Street, Oxford Street and Regent Street, said the weeks before and after Ramadan mark “significant trading periods” in the retail calendar. A further boost comes for London’s upmarket hotels. The Park Tower Knightsbridge reports an increase in bookings from the Middle East around this year’s Eid holiday. “This year as with previous years the hotel is extremely busy over the Eid period running at over 95 percent occupancy throughout the duration,” said hotel manager Sue Finaly. Rooms at the hotel start at £379 ($643) and Arabic guests are being offered dates and baklava during Eid – as well as traditional dishes like moutabel, hummus and halal lamb all year round.